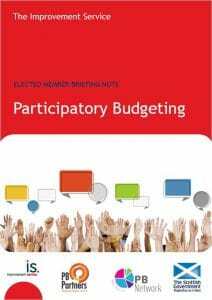 With editorial support from PB Partners a new resource for elected members on the opportunities brought by participatory budgeting(PB) has been published by the Scotland based Improvement Service. The Improvement Service (IS) developed an Elected Members Briefing Series to help elected members keep pace with key issues affecting local government. New ideas for more develoved commissioning of services, as proposed by the Commission on Strengthening Local Democracy, and new laws such as the Community Empowerment (Scotland) Bill, (expected to be passed by the Scottish Parliament by mid-2015), provide opportunities for elected members to be listening to and acting on the concerns of residents.